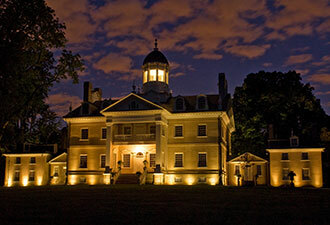 The Hampton Mansion at night. The Drawing Room is one of the mansion’s most extravagant rooms. Over 95% of the artifacts on display are original to the site. Stylish participants in Hampton’s Victorian Games Day. At first glance, Hampton National Historic Site may simply remind you of a bygone way of life, but for those who cross the threshold, there is more than meets the eye. Given its location, only 20 miles from the Mason-Dixon Line, and ten miles north of Baltimore, discovering an estate like this might surprise you. First, a brief lesson to reveal what makes this place unique. The Hampton estate was the home of the Ridgely family – prominent in Maryland history – and remained in their hands from the 1760s until 1948 when it became part of the National Park System. And, instead of cotton or tobacco, the Ridgely family fortune was made in iron production. When it was completed in 1790, the grand mansion, which dominates the landscape and acts as its centerpiece, was the largest private residence in the United States. It truly epitomized the term “the big house.” While slave labor was the core of the estate's workforce, the Ridgely family freed more than 300 slaves in 1829, one of the largest manumissions in Maryland history. 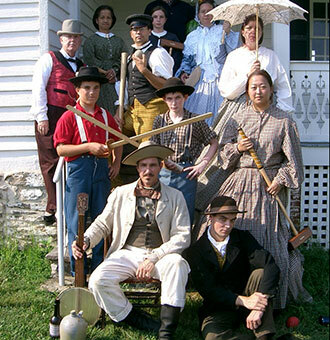 Hampton National Historic Site reflects more than 200 years of history. 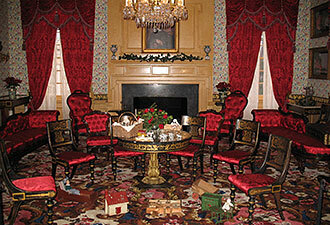 Unlike many historic homes, 95 percent of the furnishings and artifacts on display are original to the house, and each room represents a different era. Fans of Jane Austen will enjoy the dining room, while Civil War buffs will want to spend time in the Victorian Drawing Room. Servants' bells, still in place near the kitchen, remind visitors of the people who made this lifestyle possible. While the manor house is impressive, the farm tells an equally fascinating story and still contains many original outbuildings that have long vanished on other estates. You can explore the Overseer's House, slave cabins, ice house, dairy, and tenant farmers' quarters – either on your own or with a park ranger. A stroll along the beautiful, fragrant grounds immerses you in the bucolic atmosphere of the 1800s. A dirt road dating from the 1840s links the farm complex to the mansion. Bluebirds and meadowlarks fly overhead as you mosey past the meadow, horse stables (where some of the best thoroughbred horses in America lived), to the formal gardens, and family cemetery. Restored in 2009, the parterres – formal gardens built on terraces – are a treat for plant lovers and garden enthusiasts. Over 30 different flowering plant species elegantly grace the geometrically precise falling gardens. In addition to small plants, historic trees – both native and exotic – stand watch over the grounds. These include Catalpas dating from the Revolutionary War; one of the first Saucer Magnolias planted in the United States; and a 100-foot Cedar of Lebanon, planted by the third mistress of Hampton and often regarded as the “Crown Jewel” of the estate; and the famous Weeping Japanese Pagoda tree, a Maryland State Champion. For a special treat, visit on the second Sunday of the month! The park's Second Sunday programs offer a wide-range of free activities including jousting, carriage rides, period music, sword-fighting, hunting dog demonstrations, and a pony party. To find out what's coming up next, just visit the park's website. Whether you like formal gardens, African-American history, historic house museums, or quiet places to reflect on America's past, Hampton National Historic Site has something to offer. And, if you never thought you were that into history, it's worth getting off the Baltimore beltway to have Hampton change your mind. While you're in the neighborhood, don’t miss Fort McHenry, a very short drive from Hampton.